As we've all heard from the iphone commercials, there's an app for just about anything. And soon, you'll even be able to get an anti-aging treatment from your phone! United Holdings Group will be launching a set of ten anti-aging applications for the iphone in January 2010. The apps promise to treat wrinkles, acne, skin elasticity, hair growth, and even joint pain for a mere $2.99. According to the company, the apps work by using wavelengths of light and sound to stimulate a healing response in the cells, causing them to produce collagen and elastin. 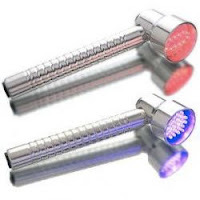 It sounds like the idea is based on LED photorejuvenation therapy, offered by dermatologists and companies like Tanda and Osmotics Cosmeceuticals. While LED therapy is proven to stimulate collagen and elastin (with red and amber light therapy) and kill acne-causing bacteria (blue light therapy), I'm not sure how well an iphone app will be able to replicate those results, but for $2.99, I'll find out for myself! Will you be trying the anti-aging app? light therapy is beneficial in many more problems like to cure from acne, scar, wrinkle as well as anti aging problem.